Enjoy your own private casita overlooking the vineyard. It's wonderful! We are on 258 acres in Sonoma's wine country with quick access to Napa, too. 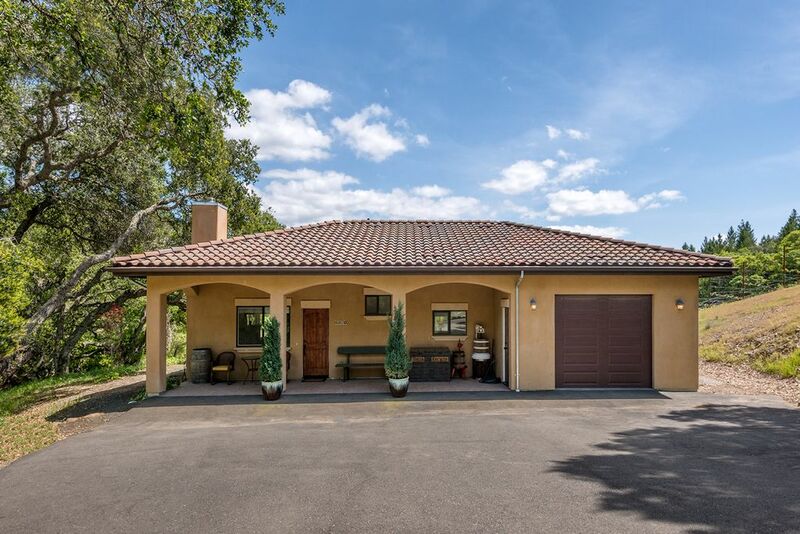 Your spacious, bright, vineyard casita is among the vines on 258 acres with wooded trails and breathtaking vistas about an hour north of the Golden Gate Bridge. Cities close by (20-45 minutes) include, Calistoga, St Helena, Sonoma, Santa Rosa, Kenwood, Glen Ellen, and Healdsburg. You’re surrounded by wineries and great restaurants. All amenities provided, including coffee, a bottle of estate wine and 2 vineyard wine glasses, as our gift. Fully equipped kitchen. Covered outdoor dining with grill. Wildlife sightings can include deer, foxes, wild turkeys, owls, hawks, California quail, and more. We love wine and good food, so living in the wine country is perfect! Plus, we can be outside almost year round. We wanted a place with amazing weather, real people, friendly people and space for our horses. We loved the property from the moment we drove in to see it the first time. It's expansive and remote, while being only 15 minutes from the city of Santa Rosa. Our neighbors are wonderful, and mostly, we love wine and good food. We are in paradise out here! Gorgeous views during the day. A starry sky at night. It's quiet and relaxed on the side of Saddleback Mountain. It's a romantic place to sit on the observation deck or your back patio. Look out over the vineyards while drinking our estate wine. Take a walk through the woods or hike up the mountain just a few steps from your front door. You are just a few minutes from wineries for wine tasting, and fantastic restaurants. In this area, you can take your wine to any restaurant and they'll just add a small corkage fee to your bill for opening and serving it. So if you find one you like and buy a bottle at the winery, you can take it to the restaurant to enjoy with your meal. You have easy access to Napa Valley wineries, as well as those in Sonoma County, open 7 days a week. Drive west about 40 minutes to the town of Bodega Bay, on the coast. This is where Alfred Hitchcock filmed his movie "The Birds!" Experience a real vineyard. Cook at your guest house and sit on the back patio for dinner. In the morning, it's a perfect place to watch the sun rise while enjoying your coffee and breakfast. If this sounds good to you, we know you will thoroughly enjoy the property! Welcome! Located on the side of the Sonoma Mountains, on Saddleback Mountain between Santa Rosa and Calistoga. The guesthouses are nestled among the vines in the vineyard with spectacular views. In the heart of the Sonoma wine country, surrounded by wineries and fantastic restaurants. This is a foodie area, in addition to having some of the best wine in the world. The pace is relaxed. The weather is perfect most of the year. Drive out to the coast for lunch. Reach the north end of the Napa Valley is 20 minutes. The most scenic towns in the Sonoma and Napa Valleys are 20-45 minutes away. We are just over an hour north of the Golden Gate. We have a great list of restaurants in Santa Rosa, Sonoma, Healdsburg, Kenwood, Sonoma, Calistoga and St Helena. Tour companies await your days in the wine country. Or visit a farmers market to purchase the freshest of ingredients to cook your own dinner at the Casita. Then, sit on your back patio, overlooking the vineyard and enjoy a wonderful dinner with the wine of your choice while watching the sun set over the mountain. There's a deck on the property with vistas that range from the city below to the San Pablo Bay. Take a picnic or appetizer with your favorite wine, and you won't be disappointed. If you are a walker/hiker, we are on 258 acres. You can take the moderate path through the woods, or head straight uphill on the paved driveway or the side of the mountain. This is a terrific place to escape the summer heat around the country. You'll need to have a jacket for the evenings, even when the daytime is quite warm. The Casita has a full kitchen, equipped with pots, pans, dishes and some basic seasoning. There's a Keurig coffee maker with pods, and a refrigerator. The Casita is private and you can drive right up to the door. There are no steps or stairs. There will be soap, shampoo, hair dryer, towels, and all the amenities you need in the bathroom. The bedroom faces west, so the sunrise can wake you, unless you prefer putting the shades down and sleeping in. Have your coffee on the back patio while you watch the property and vineyard come to life. You will return home relaxed and refreshed after spending time with us in the Casita!